I spent the last couple of months trying to seek out the orange wines that are available in the Houston area. Orange wines were a bit of a novelty for me with just the occasional glass at a wine bar or at a wine friend's house. Although I dine out "in town" as much as I can, I also do a lot of dining out in the suburbs. This type of wine, unfortunately, is not a feature on anyone's list out there. This spring, I decided to see what orange wines I could find in our broader market, I wrote about what I found in a feature for Snooth. Side note for my fellow Houstonians, I found the best retail selections at the Houston Wine Merchant and the best wine menu offerings at Dolce Vita. 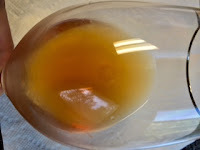 Click here to read about the best orange wines I tasted on Snooth!